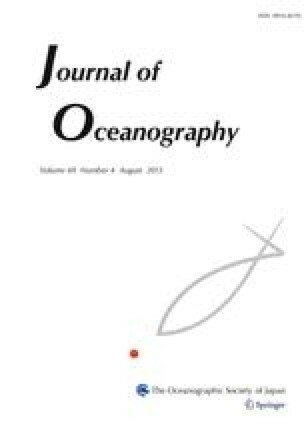 ADCP, CTD and XBT observations were conducted to investigate the current structure and temperature, salinity and density distributions in the Soya Warm Current (SWC) in August, 1998 and July, 2000. The ADCP observations clearly revealed the SWC along the Hokkaido coast, with a width of 30–35 km and an axis of maximum speed of 1.0 to 1.3 ms−1, located at 20–25 km from the coast. The current speed gradually increased from the coast to a maximum and steeply decreased in the offshore direction. The SWC consisted of both barotropic and baroclinic components, and the existence of the baroclinic component was confirmed by both the density front near the current axis and vertical shear of the alongshore current. The baroclinic component strengthened the barotropic component in the upper layer near the axis of the SWC. The volume transport of the SWC was 1.2–1.3 SV in August, 1998 and about 1.5 SV and July, 2000, respectively. Of the total transport, 13 to 15% was taken up by the baroclinic component. A weak southeastward current was found off the SWC. It had barotropic characteristics, and is surmised to be a part of the East Sakhalin Current.